← Resource: Phytotoxicity Concerns When Tank Mixing. Diazinion and Captan. A welcome worker from Asia has appeared in the United States to help in the fight to reduce fall invasions of BMSB to crops and homes. The Samurai Wasp, Trissolcus japonicus was recently discovered in the Mid-Atlantic States, the North West Coastal States of Oregon and Washington, and here in the Hudson Valley, captured using flash frozen sentinel eggs of Brown Marmorated Stink Bug (BMSB) on Hepworth Farms in Milton, NY in late August of 2016. 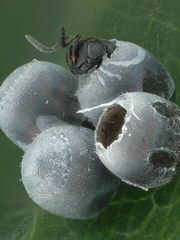 This wasp is an egg parasitoid, utilizing BMSB egg clusters for its own reproduction. It is capable of laying its own egg within most of the BMSB eggs in a cluster of roughly 28 eggs. The wasp egg hatches into a larva, feeding on the developing stink bug nymph, destroying the stink bug and within a few weeks, emerges to repeate the cycle over the course of the season. A single adult wasp emerges from each stink bug egg. In Eastern Asia (China, Japan, and South Korea), where BMSB and Samurai Wasp originate, the wasp is credited for maintaining low levels of the invasive Brown Marmorated Stink Bug. Roughly 2mm in length and barely visible in the field, the insect is cold hardy, residing along the edge of the agricultural forest interface where BMSB lay their eggs. 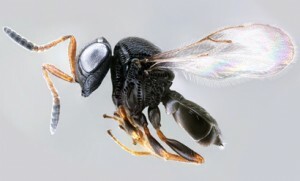 The Samurai Wasp is the principal natural enemy of the Brown Marmorated Stink Bug in Asia, with parasitism rates up to 70% and an average annual rate of 50%. Because of its high parasitism rates and biological adaptations, it has the potential to be a strong biocontrol candidate of BMSB in the US 1. A very important aspect of the biology of these two insects is their host ecology. The BMSB is an arboreal insect, overwintering, feeding, reproducing, developing and residing in deciduous forests. The stink bug will stay in forest trees until populations of BMSB overwhelming the forest system, reducing food resources, decline from drought or poor tree health, or if the insect requirements for food resources increase. They will then move to crops containing fats, carbohydrates and moisture to begin the move into overwintering sites and diapause for roughly 6-months. Meanwhile, the wasp (from our observations) tends to reside far enough away from agricultural systems so as to not be heavily impacted by farm pest management activities, increasing its success in the agricultural / forest landscape. At the Hudson Valley Research Laboratory, entomology staff have developed colonies of BMSB to provide eggs for the Samurai Wasp to lay their eggs and slowly build a colony of Trissolcus japonicus. In August 2017, after weeks of placing freeze killed sentinel BMSB egg clusters in the field, we began seeing the Samurai Wasp emerge. The eggs they have parasitized over the past few weeks are being placed onto farms throughout NY State. Upon emergence and successful establishment they will begin providing relief from the damage caused by BMSB to crops for NYS farmers while reducing the presence of the insect in homes in the region. To date we have placed over 2300 ‘Samurai Wasp eggs’ in 28 release sites on NY Farms in Monroe, Orleans, Columbia, Dutchess, Ulster and Orange counties. This late in the season the success of the Wasp release will rely on its ability to overwinter in these sites. In the Monroe County orchard site we believe we were able to successfully recapture the wasp using sentinel eggs and are awaiting species confirmation to determine its successful establishment. Over the next few weeks we hope to have at least ten more sites added to the map if warm weather holds. However, as cold temperatures are sustained, we will likely see lower levels of wasp emergence and possibly lower establishment. If funding is available for the project in the spring of 2018 we plan to visit the release sites, carrying frozen BMSB sentinel egg clusters to the field to lure the Samurai wasp into visiting and parasitizing these eggs. In this way, we bring back the sentinel eggs, which carry the immature wasp, rear them until the wasp emerges, which would confirm its establishment leading to its future success in biological control of the invasive Brown Marmorated Stink Bug in each site. If the project succeeds, we should see reduced populations of BMSB, reduced crop injury, fewer insecticide applications to control the pest and fewer adults BMSB in our homes. Support of this project is very welcome! Hoebeke ER, Carter ME. 2003. Halyomorpha halys Stål (Hemiptera: Pentatomidae) a polyphagous plant pest from Asia newly detected in North America. Proceedings of the Entomological Society of Washington 105: 225-237. Haye T. 2014. Seasonal field parasitism of Halyomorpha halys and co-occurring non-target species in China. Brown Marmorated Stink Bug Working Group Meeting, Georgetown, DE. Matsuo K, Honda T, Itoyama K, Toyama M, and Hirose Y. 2016. Discovery of three egg parasitoid species attacking the shield bug Glaucias subpunctatus (Hemiptera: Pentatomidae). Japanese Journal of Applied Entomology and Zoology (in Japanese, English abstr.) 60: 43-45. Talamas EJ, Herlihy MV, Dieckhoff C, Hoelmer KA, Buffington M, Bon MC, Weber DC. 2015b. Trissolcus japonicus (Ashmead) (Hymenoptera, Scelionidae) emerges in North America. Journal of Hymenoptera Research 43: 119-128. Yang Z-Q, Yao Y-X, Qiu L-F, Li Z-X. 2009. A new species of Trissolcus (Hymenoptera: Scelionidae) parasitizing eggs of Halyomorpha halys (Heteroptera: Pentatomidae) in China with comments on its biology. Annuals of the Entomological Society of America 102: 39-47.